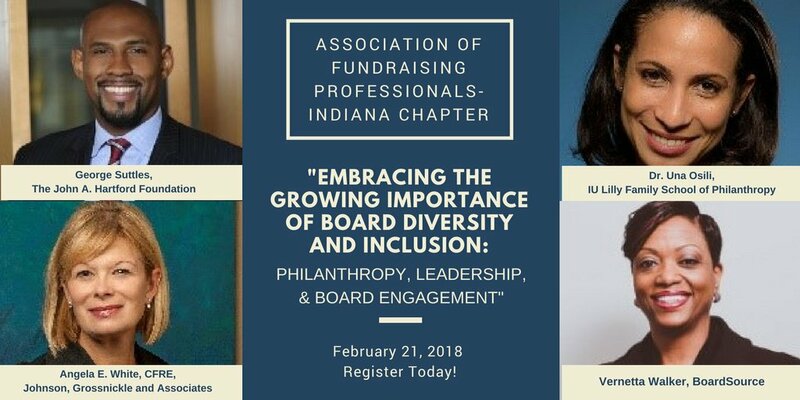 AFP-Indiana's February 21 program will be the setting for the first national presentation of important new research on the impact of board diversity and inclusion. The Indiana University Lilly Family School of Philanthropy, Washington, D.C.-based BoardSource, and Johnson, Grossnickle and Associates partnered to examine data from BoardSource's Leading with Intent survey, IU's million-dollar database, and Form 990s for correlations between board diversity, engagement, and impact. Time: 11:30 a.m. Registration and Lunch Buffet; 12 - 1:15 p.m.
Dr. Una Osili is the associate dean for research and international programs at the Lilly Family School of Philanthropy. Dr. Osili leads the research for the Index of Global Philanthropy and Remittances and the Index of Philanthropic Freedom. She is the current chair of the research committee of the Women's Philanthropy Institute, and is a member of the research committee of Lake Institute on Faith & Giving. She leads the school's extensive research program for its partners including U.S. Trust, United Way Worldwide, United Student Aid Funds, and National Collegiate Athletic Association. Dr. Osili provides guidance for the research for Giving USA, which is published by Giving USA Foundation. She also directs the school's signature research project, the Philanthropy Panel Study (PPS). PPS is the largest and most comprehensive study of the philanthropy of American families over time. A prolific researcher with an extensive body of published research, Dr. Osili earned her B.A. in Economics at Harvard University, and her M.A., and Ph.D. in Economics from Northwestern. Vernetta Walker is Chief Governance Officer and Vice President of Programs for BoardSource. She leads BoardSource's sector-wide initiatives on topics such as diversity, equity and inclusion, nonprofit governance trends, and board advocacy. Vernetta is a frequent speaker on exceptional governance practices, board responsibilities and engagement, and strategies for transformative change. Her clients have included the Smithsonian National Museum of the American Indian, YMCA of the USA, The National Aquarium, Corporation for Public Broadcasting, Independent Sector, and National Council of La Raza. Prior to BoardSource, Vernetta served as associate general counsel for the Maryland Association of Nonprofit Organizations, was foundation advocacy counsel for the Alliance for Justice, and practiced law for several years in Orlando, Florida. She also served as director of the Administration of Justice Grants Program for the Florida Bar Foundation. Vernetta is an adjunct lecturer in the masters of nonprofit management program at Columbia University School of Professional Studies. She is also a faculty member of NeighborWorks America and received their Kenneth Jones/ Tony Austin Excellence in Training Award. Vernetta is a contributing author to Nonprofit Management 101: A Complete and Practical Guide for Leaders and Professionals, a Jossey-Bass publication (2011), and Investing in Change: A Funder's Guide to Supporting Advocacy, an Alliance for Justice publication (2004). She received a juris doctor from the Washington University School of Law, St. Louis, Missouri, and a bachelor of arts degree from the University of Maryland, College Park, Maryland. Angela E. White, CFRE, has been instrumental in JGA's success since 1996, when she joined the JGA team. In 2011, she became CEO of JGA, responsible for providing day-to-day leadership to the firm and guiding the JGA staff, while continuing to provide tailored consulting services directly to clients. Angela has a high level of expertise in philanthropic consulting in healthcare, education, social services, arts, and faith-based organizations. She also has considerable depth in strategic planning and data analysis. Angela is a member of the faculty at The Fundraising School at the Indiana University Lilly Family School of Philanthropy and often presents on behalf of the Women's Philanthropy Institute. She currently serves on the Committee on Directorship for CFRE International. She has served as the Conference Co-Chair for CASE District 5, the Vice President for Membership for the Indiana Chapter of the Association of Fundraising Professionals, and as the Chair of the Indiana Achievement Awards. In 2012, Angela was recognized as a Women of Influence honoree by the Indianapolis Business Journal for her extensive work with Indianapolis-area nonprofits and her efforts to advance the understanding of women's philanthropy. Angela is a CFRE, graduate of Saint Mary-of-the-Woods College in Indiana, and obtained her Master's degree in business from Purdue University. George Suttles is a Program Officer with The John A. Hartford Foundation. Before joining the Foundation, he was a Senior Philanthropic Relationship Manager in the Philanthropic Solutions division of U.S. Trust, where he served as a relationship manager for private family foundations, charitable trusts, and nonprofit organizations. He advised clients in grant-making trusts where Bank of America, N.A. served as trustee and made grants in the areas of education, health care, medical research and social services. Prior to joining U.S. Trust, he was a program manager at the Anthem Foundation, the philanthropic arm of Anthem Inc. and a Program Officer at the New York State Health Foundation, a statewide private foundation working to improve the health of all New Yorkers. He earned his B.A. in African American Studies from Wesleyan University, his M.P.A. at the Baruch School of Public Affairs (CUNY) through the National Urban Fellows Program, and his M.A. in Philanthropic Studies from the Indiana University Lilly Family School of Philanthropy. George serves on the nonprofit boards of Odyssey House, The Support Center, and the Storefront Academy as well as volunteers in varying capacities with several other organizations in New York City. He has participated in several leadership development programs, notably the Association of Black Foundation Executives "Connecting Leaders" program and the Council of Urban Professionals Leadership Fellows program.